Hugh Fearnley-Whittingstall chocolate and red kidney bean cake recipe – a healthy and tasty cake recipe I turned vegan! And she was still here! The vegan, I mean. So far, so good. No accidental egg, sneaky cheese or suspicious milk products, to the best of my knowledge. I had a lot of making up to do, since I totally didn’t remember she was a vegan for our wedding breakfast. *sorry* So after kofte last night, came… pudding (I’m Northern. I mean dessert, just in case anyone is confused). I mean, it’s definitely less difficult to not put animal products in sweets, but the idea of making a cake without egg or butter worried me slightly – just because it’s the “norm” and I hadn’t done it before. I found a Hugh Fearnley-Whittingstall chocolate and red kidney bean cake recipe that I’d wanted to try out for ages, a recipe for a “healthy” cake…and it’s actually the bomb! It was a chocolate cake with red kidney beans, and I figured it’d work as a vegan cake too. Just a matter of removing the egg. 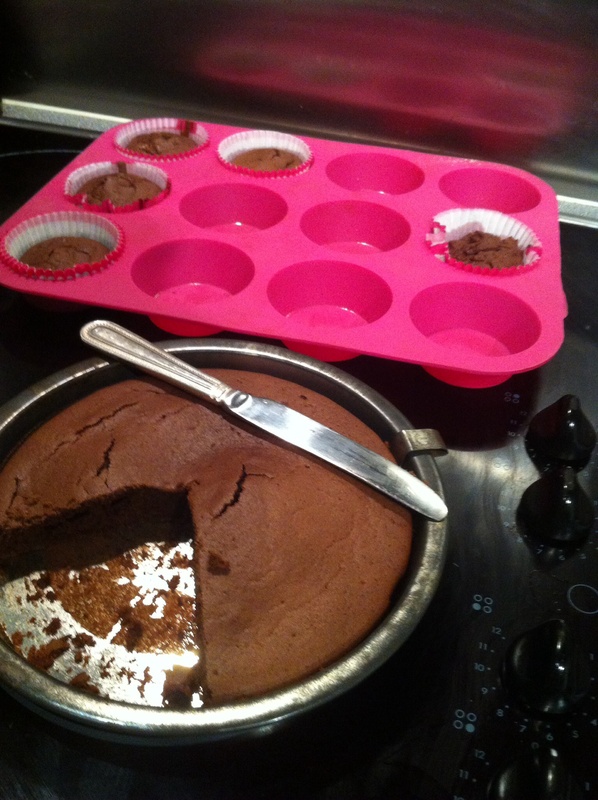 I figure the red kidney beans are a great hit of protein too, and in cakey form! This is before Lent had begun, so I made half of the recipe to his spec (i.e. with egg, for us then-non-vegans), and 1/2 with no egg. It went well! I’m annoyed I didn’t make it fully vegan to be honest, but I suppose I wasn’t quite prepared for Lent yet, and had some more vegan reading to do. 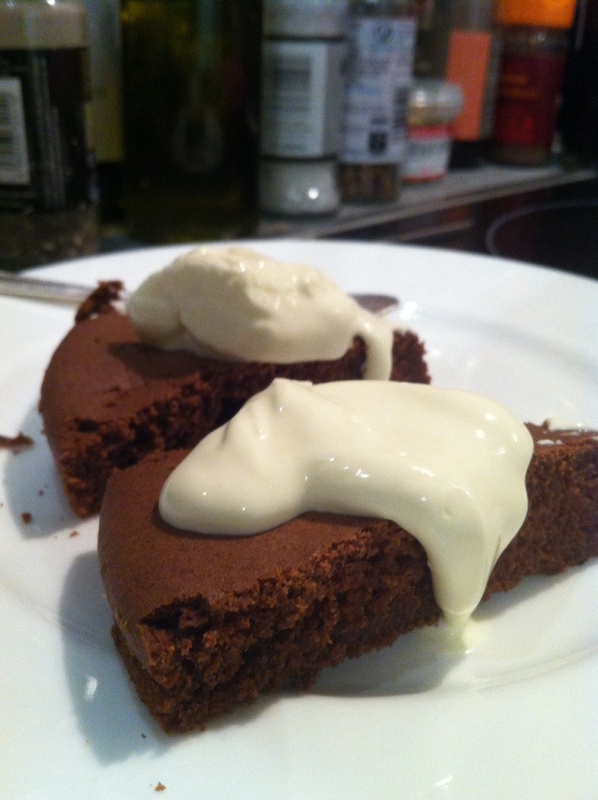 here enjoyed with some distinctly un-vegan creme fraiche – but this recipe is lovely and moist with no topping at all. Coconut cream would be lovely! Lightly oil a 20cm cake tin (preferably springform, otherwise use greaseproof paper) and line the base with greaseproof paper/baking parchment. Blend the oil, beans, egg or egg substitute and vanilla essence in a blender. Sieve together the cocoa, baking powder and sugar. Pour the liquid mix into the dry mix and whisk until combined. Pour the mixture into your cake tin evenly. Bake for 20-25 minutes – check it, and whisk it quickly out of the oven as soon as your skewer comes out clean. This is best slightly underdone, not overdone! 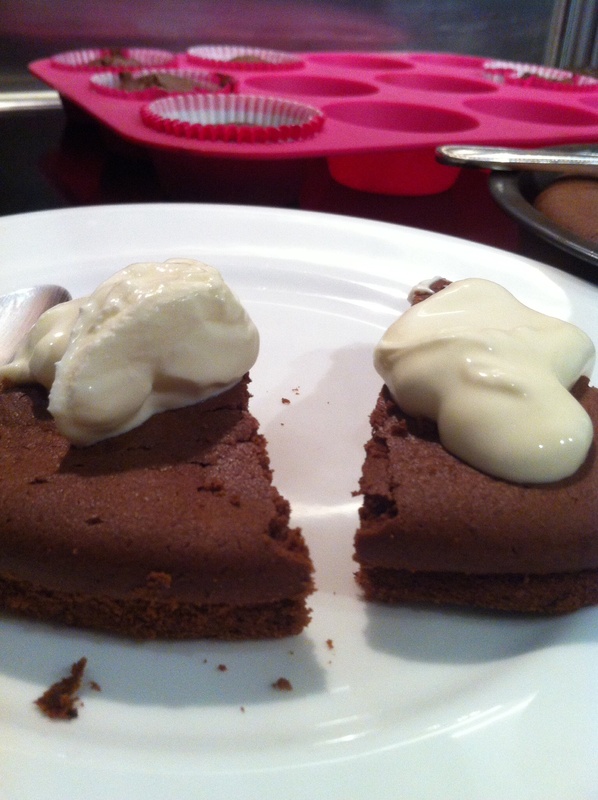 Here it is, with distinctly un-vegan creme fraiche…all squishy and fudgey! Yes please! Now that it’s lent and I’m eating vegan I wouldn’t go in for the creme fraiche of course. 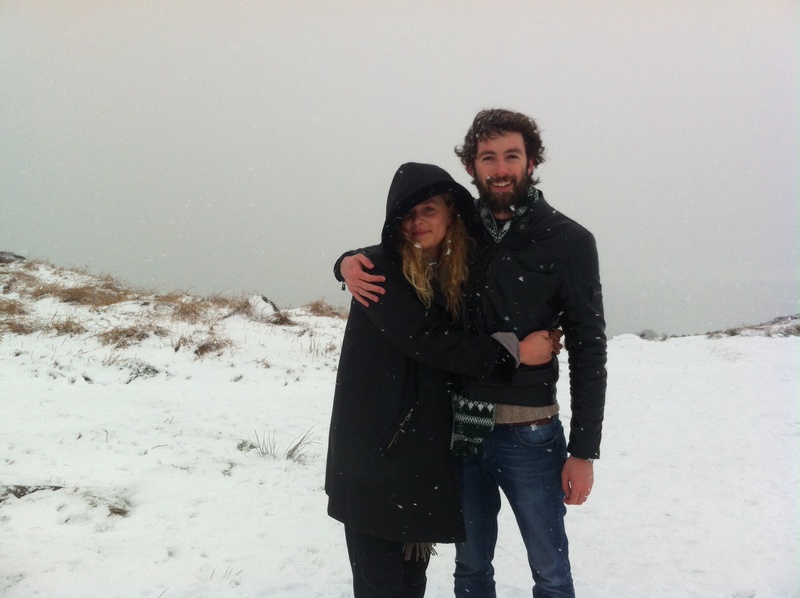 Here’s the little vegan herself, and the Man. Find Tharavadu blinking at you sleepily on Mill Hill, next to its cool brother Bundobust. It’d be a crime to miss it, really it would. If you ever can’t be bothered to cook when you have a guest up, (especially a veggie), take them here. They won’t complain. If you haven’t visited yet, you should – it’s not a veggie restaurant but obviously has lots of veggie options, and for us meat eaters (non-lent time of course! ), go for their Kozhi Dosa – the tastiest chicken curry ever wrapped in a frail and fragile masala dosa wizard’s hat. Seriously. Tasty.